“The long-term value of a company is based on the speed and quality of its decision-making.” These are the words of Jeff Weiner, CEO of LinkedIn. He was speaking to the 2018 graduating business school students at the University of Pennsylvania. He observed, “It’s hard to make better decisions faster when people on the team lack trust in one another and are constantly questioning each other’s motivations.” It is no fun, says Weiner, to work in a low-trust environment where people spend the majority of their time “navigating corporate politics rather than focusing on the task at hand.” This may sound uncomfortably familiar to some people. This made me wonder whether the 22-year old Jeff would have heeded his older and wiser future self’s words. There are many lessons that I would love to teach my 22-year old self. However, my young head was in a different place, not always mature enough to know when I needed to accept advice. With youth comes an abundance of time, energy and eagerness to learn from youthful mistakes rather than seasoned advice. I even wonder whether the message of “be compassionate” resonates with high-achieving 22-year old male business school grads. They have been taught to compete all of their lives, in sports, school and socially. How would a 22-year old Jeff striving to prove himself hear the words of a 40-something married-with-children Jeff? 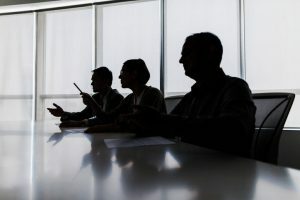 Sadly, when I searched for a stock image for the word “distrust”, the first result was a silhouette of business people sitting at a negotiating table. It is pictured above. This may reflect a popular view that business is inherently cut-throat and that the people across the table are not to be trusted. Business schools may be emphasizing compassion and empathy in the workplace, inviting guest speakers such as Jeff Weiner, but ultimately it is up to leaders to set the example and shape positive corporate cultures. Jeff Winer says LinkedIn has tried to create a culture where, “people take the time to understand the other person’s perspective and not assume a nefarious intention, build trust and align around a shared mission.” This allows them to make important decisions in minutes or hours that may take companies plagued by mistrust months. Compassion creates a competitive advantage.